Birdie’s Biscuits, available at Reading Terminal. When Birdie's Biscuits founder Jeffrey Presley set out to re-create his Southern great-grandmother's biscuit recipe, he was drawing his own road map based on what he remembered. "She went by taste, by sight," said Presley, of Philadelphia, who added that she used to roll out dough with a thick glass Coca-Cola bottle. "There was no recipe for it. I knew what I was looking for, I just didn't know how to find it." It took Presley, a Culinary Institute of America graduate, about two years to get it right by experimenting with fats, lard, and butter. 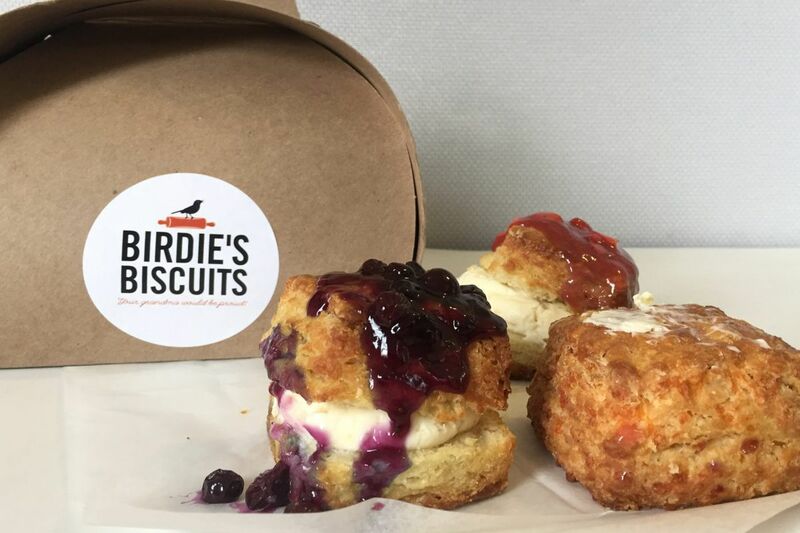 About a year ago he launched Birdie's Biscuits, which sells more than a half-dozen flavors of biscuits at Reading Terminal Market three days a week. The dense, rich biscuits come in a few savory flavors, including cheddar. He also makes indulgent varieties that taste more like cake than biscuits, including rich blueberry and strawberry cheesecake versions with fruit toppings and sweet, creamy filling. Presley bakes the biscuits from scratch and uses ingredients sourced from Reading Terminal vendors. Birdie's Biscuits, $4 at Reading Terminal Market on Thursdays, Fridays, and Saturdays; jeffreybirdiesbiscuits.com.